St. Gregory of Nyssa, in his Great Catechism, observes that a Christian who is baptized but experiences no change in his life is, in the words of St. Paul, “a man who thinks himself to be something, when he is nothing, and deceives himself.” In addition, St. Gregory offers us the example of Zacchhaeus, from whom we can learn what it means to realize our own imperfection, make a volunteer effort to be united to Christ, and experience the beginning of perfection through obedience to Christ, repentance, and transformation. Initially, Zacchaeus came up short in a lot of ways. He was not tall enough to see over the crowd; he was a tax collector, made wealthy by extortion and despised by the people. Yet when he heard that Christ was about to pass his way, “he wanted to see who Jesus was”. This is the initial act of faith that we must never abandon. Who is Jesus? If He is the Son of God, our lives are about to be transformed forever. Does each of us believe He is the Son of God? The real answer to this question is manifested in our thoughts, words, and deeds. Thorough repentance often includes admitting that we ‘know’ Jesus is the Christ but we don’t truly ‘believe’ this. 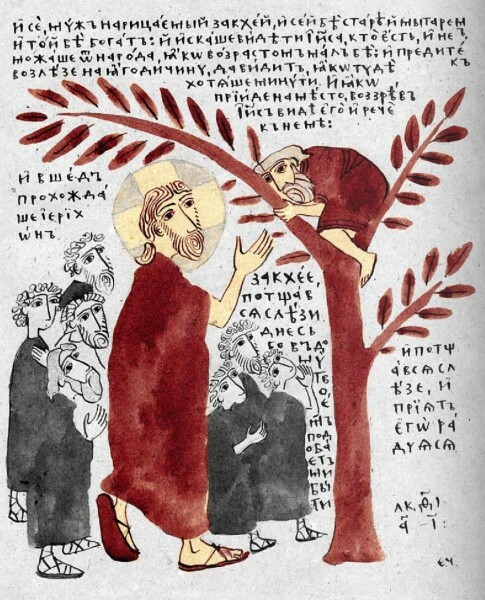 Zacchaeus wanted to know who Christ was, so he climbed the tree. When Christ called him down from the tree, “he made haste and received Him joyfully.” And when rebuked for his sins, Zacchaeus repented and made a radical change of life. 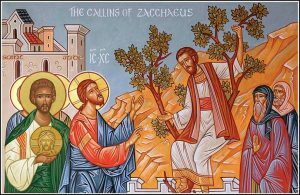 After the Resurrection Zacchaeus became a disciple of the Apostle Peter, who eventually appointed him bishop of Caesarea in Palestine, where he faithfully served the Gospel and died peacefully. We too come up short most of the time. Often as well, when we look inside ourselves, the chaos within paralyzes us rather than motivating us to action. We must be a people of action. Do I believe Christ is the Son of God? Yes! Have I been baptized into His Church and for the remission of sins? Yes! Do I confess my sins for the renewal of my Baptism and in preparation for holy Communion? Yes! Do I pray regularly in church and privately for discernment of my own condition? Yes! Do I observe my life and actively work, study, and discipline myself consistently for the eradication of sin and ever-increasing spiritual understanding? Yes. We do not need self-help books; we have Christ and His holy Body, the Church. To procrastinate or ignore this simple reality is to choose ignorance over knowledge, death over life, emptiness over fulfillment, mortality over immortality, and in the end hell rather than heaven. Like Zacchaeus, we too must want to know who Christ is and enter into communion with Him. Now is the time to take action. Today is the day of salvation. Fir in the end, even a lifetime is too short.